What do you all think is the most popular song, and the most popular album of the past year? Is it “You Say” from Lauren Daigle, which has shot up the charts, and has dominated radio airplay on both mainstream and Christian radio? Is it “Reckless Love” from Cory Asbury, the worship song on everyone’s minds due to ambiguous theology? Is it “The Middle” from Zedd, Grey and Maren Morris, in my opinion the most overplayed pop song of the year? Or is it “Shallow” from Lady Gaga and Bradley Cooper, the lead single from the musical movie A Star Is Born? Maybe it’s for KING & COUNTRY’s comeback single “joy.”, from their 3rd album Burn The Ships? Or what about “I Can Only Imagine (The Movie Session)”, by MercyMe- rerecorded as a companion piece to the movie of the same name which released in March, about the life of Bart Millard, how his father died, and how he started the band? In my opinion, it’s none of these songs. Though I may be wrong (and if I am, someone please correct me! 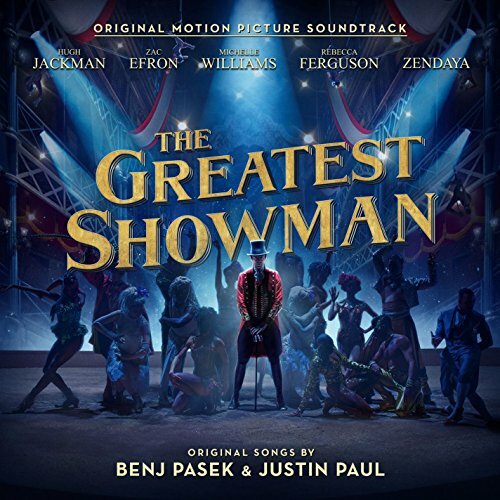 ), I believe that the most popular song is “This Is Me” from The Greatest Showman; and the most popular album is The Greatest Showman (Original Motion Picture Soundtrack). Is that crazy for me to even think that? Maybe, but I don’t think so. All throughout this year, I heard plenty of songs from The Greatest Showman on radio. “This Is Me”, “Rewrite The Stars” and “Never Enough” were all played frequently on the airwaves, so much so that I knew these words off by heart even before I saw the movie. And as I was looking for youtube videos every once in a while, online, I’d always see that various other youtube stars and artists were covering various songs from The Greatest Showman. I was intrigued; yet had no idea what the big fuss was about, and always kept this knowledge of the number of covers of Greatest Showman songs in the back of my mind, knowing that I’d see the film at a later date. When I saw the movie finally a month or so ago, everything started to fall into place, the songs held greater meaning, and it was then that I understood why listeners loved these songs so much, gravitated to them, and held onto them for dear life- I now knew why The Greatest Showman (Original Motion Picture Soundtrack) was in my opinion the most popular album in the world all of this year- it’s the fact that the lyrics transcend the movie plot and are applicable to our everyday lives as well. Though the storyline of the film had a role in people’s eagerness, interest and anticipation of the movie, it was truly the work of Justin Paul and Benji Pazek as songwriters of the entire album, that has propelled this musical to the heights that it is right now. So…you don’t know Justin and Benji? Well now you probably would, as I quickly dive in deep and let you know about these songs (which you probably know already!) and what they mean in my life. For those of you who are not aware of The Greatest Showman (how could you not be familiar with such a masterpiece? ), let me quickly give a spoiler-free run-down. PT Barnum (Hugh Jackman) dreams about being a star as he is younger, then quickly falls in love with the daughter of one of the clients of his father. The film then basically tells the story of PT marrying this woman, and later on starting up the circus- and all of the behind the scenes work and drama that are associated with the business. And as PT learns various life lessons and also lives with the consequences of his actions, we are almost met with a deeply troubled and flawed individual, who’s happiness is conditional upon the success of his business. I won’t really dive deep into the movie (that’s for Jon in his review! ), but let me tell you that it is the songs that make the movie what it is. Without the music, the film wouldn’t be half as interesting. Interspersed throughout the entire duration, we hear 9 songs in total, with each track blowing my mind in many ways. We hear quite a few vocalists (all of the actors sing, except for Rebecca Ferguson ironically, who plays Jenny Lind, who sings “Never Enough”- sung by Loren Allred), while there are equally similar numbers of upbeat tracks to slower paced ballads. Each of these songs are positioned the way that they are in the film for plot purposes to move the story along, but that doesn’t mean listening to these songs in isolation isn’t encouraged. Yet though you can still glean any sort of message from these songs, one would appreciate these songs more if we have seen and know about the movie. “The Greatest Show” is a fun ball of joy and celebration as Hugh as PT passionately reiterates that the circus is the greatest achievement he’s ever accomplished, while also welcoming bystanders to watch his show; yet listening to this song without the movie context reminds us that there can be pivotal moments in our lives that are great, and that we should acknowledge those moments and never take them for granted. Likewise “The Other Side” is a conversation between Hugh and Zac as PT and Phillip Carlyle respectively as PT tries to persuade Phillip to invest in his business and be an active participant; however one could take the meaning of the track to be Jesus singing to us about the benefits of believing in Jesus and in the Christian faith. With every song having a double or even triple meaning (depending in whether you watch the film first or not, and also depending on your opinion on the real man of PT Barnum), it’s hard not to be lost in these heartfelt, personal, honest and emotional melodies- and their sheer popularity means that no doubt songs like “This Is Me”, “A Million Dreams” and “Rewrite The Stars” to name a few, will be present on radio, in people’s playlists, and just generally in our lives. For me personally, I have found these anthems to be inspiring, with quite a few, inclusive of “This Is Me” and “From Now On”, instrumental in me remembering to keep pressing on in life despite fears and failures; yet each one of you may view the songs differently- and that is more than fine. I’m not really sure the staying power of the movie and the companion album soundtrack, and whether The Greatest Showman will be popular in say, 10 years or so. But as of now, the album and the movie are all that the world is talking about. With the world being captivated by musicals, ever since the dawn of time, the momentum of The Greatest Showman looks set to continue for the foreseeable future. And if there’s any time to step onto the bandwagon, it’s now. So without further ado, let me say that you all need to listen to this album- if there’s only one album you listen to this year (oh, and the Greatest Showman Reimagined but that’s for another review entirely!). so why don’t you all hop to it, and let me know your thoughts later on? Well done Hugh, Zac, Michelle, Keala, Zendaya and everyone else, you’ve created something special that will last the ages, and you should be very proud of yourselves!